One of my favorite things about London is the history infused in every brick of every building. During my time there in September, I found myself taking pictures on every street, and stopping to read historical facts posted on many of the buildings. 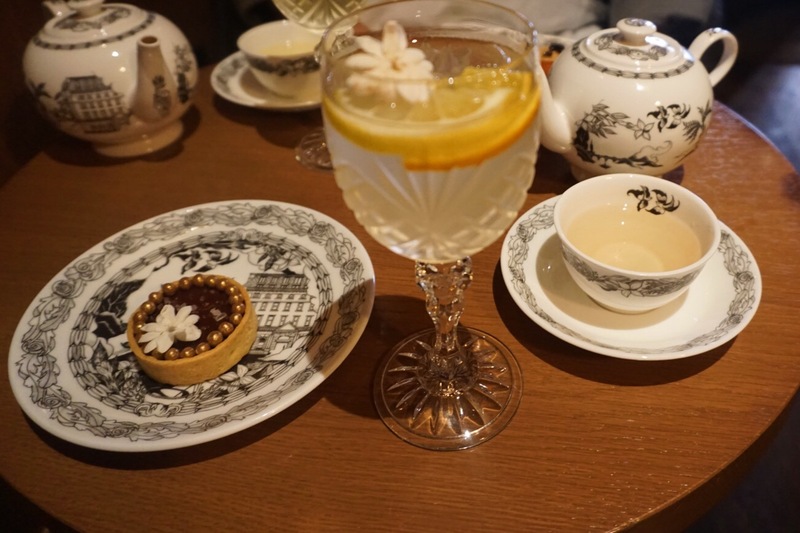 I had an afternoon tea experience that combined history with tea, food, and booze. I can't think of a better way to spend an afternoon, can you? 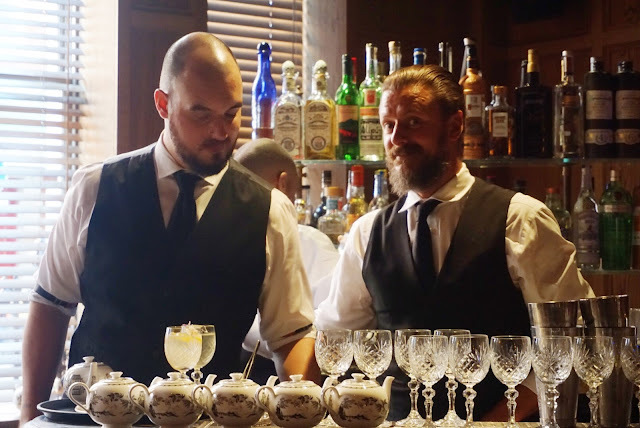 Walking through the airy Edition hotel towards the back leads you to the cozy Punch Room lined with rich wood panelling and hipster staff where beards and waxed mustaches seem to be the uniform. It feels intimate and exclusive and, well, hip. But the vibe here isn't the 'cooler than you' vibe I was expecting. 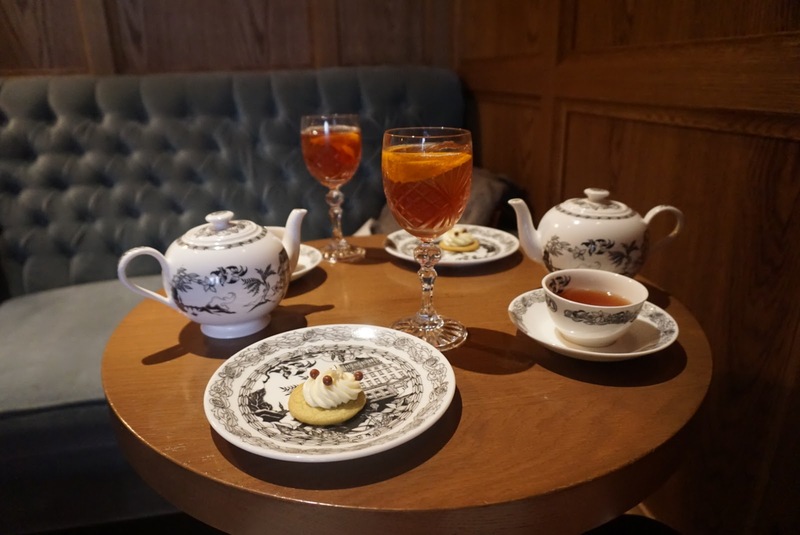 The staff was quite cheerful and our server was extremely passionate about the afternoon tea menu and history behind the selections. Our server, left, and the bartender, right. The afternoon tea experience here has been carefully crafted. 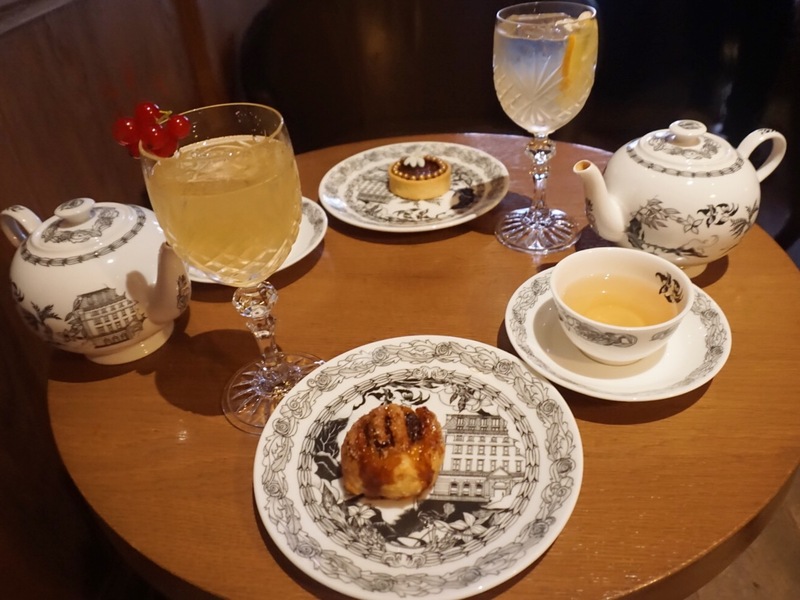 As I mentioned it combines tea, small bites, carefully prepared cocktails, all with a nod to the origins of afternoon tea. The focus here is on the flavor experience, not on posh opulence like most modern versions. Scandal Water was created by Henrietta Lovell of Rare Tea Co and Phil Carmichael, executive chef of Berners Tavern. 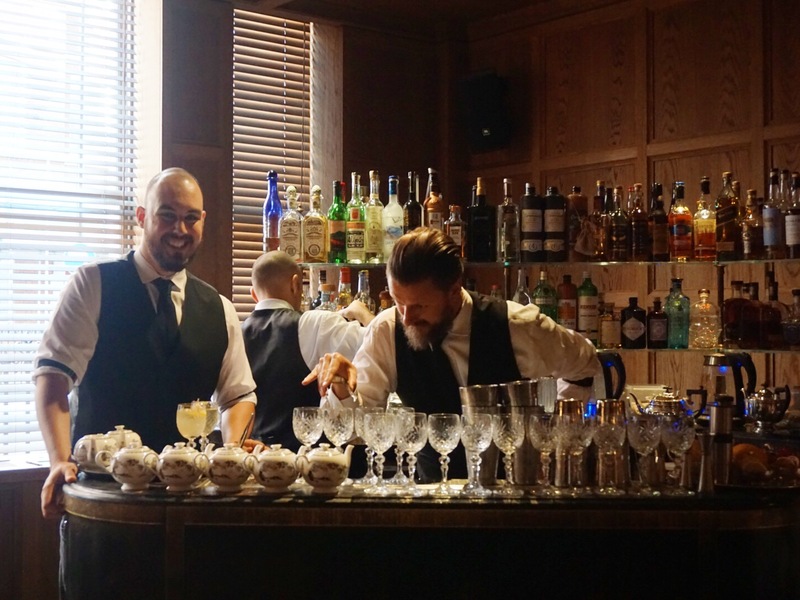 Add in the Punch Room's inventive cocktails and you have a unique experience. Punch Room's Davide Segat created cocktails based on the teas selected to be served. Our server was more than willing to explain the 5 courses available (you get to pick 3) and explain the preparation behind each selection. I was impressed with the depth of his knowledge. My husband joined me for this outing, and we each chose our 3 courses. We ended up with a few of the same as the ingredients were just too good to pass up. We were also given warm, fluffy English muffins which were far and away better than any I've tried. It was as if I hadn't tasted one before. The teas were lovely and paired extremely well with the crafted bites of food. The most successful course was Sencha tea served with exquisite diced salmon topped with crisp pastry and caviar. The punch served was a milk punch, more on that one in a bit. The experience was vegetal, marine, salty, savory, silky, crispy, tangy. My favorite tea was the 'special brew' a Chinese black tea blend that was smoky with a bit of citrus and dried fruit. It paired well with an Eccles cake that had raisins, currants, nutmeg, and cinnamon flavors. The tea was featured in the punch which also included rum, lemon juice, and thyme. It sounds like a lot of complicated flavors but everything really did work. It was a course that felt warming, sweet, and comforting. The punch brought this experience to a different level. They take punch very seriously here (how could you be called the Punch Room if you didn't? ), in fact some of the preparations take a day or more to complete. The milk punch was one of the most memorable cocktails I've ever had- it contains milk but it's crystal clear. The subtle milky flavor and mouthfeel is amazing. The milk is slowly clarified, taking out all the solids but leaving the flavor. It's a centuries-old recipe reimagined. This punch also contained cognac, rum, brandy, the sencha tea, lemon juice, and spices. It sounds insane but as with every punch we tried it was smooth, balanced, and complex. I have a few ideas on how to create my own version of milk punch (without any long and complicated procedures) which I'll be working on in the next few weeks. 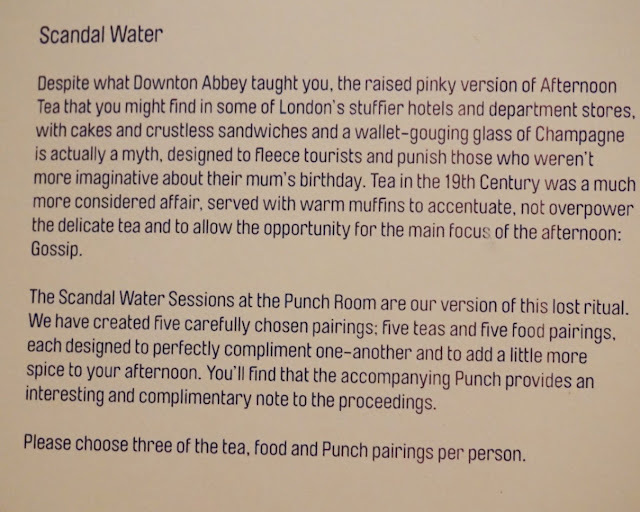 I like that Scandal Water is a departure from the heavy, excessive afternoon tea experiences most people have come to expect. I'll usually need to skip dinner after an afternoon tea but Scandal Water is meant to be more like the afternoon refreshment it was historically created to be. Just something to tide you over. 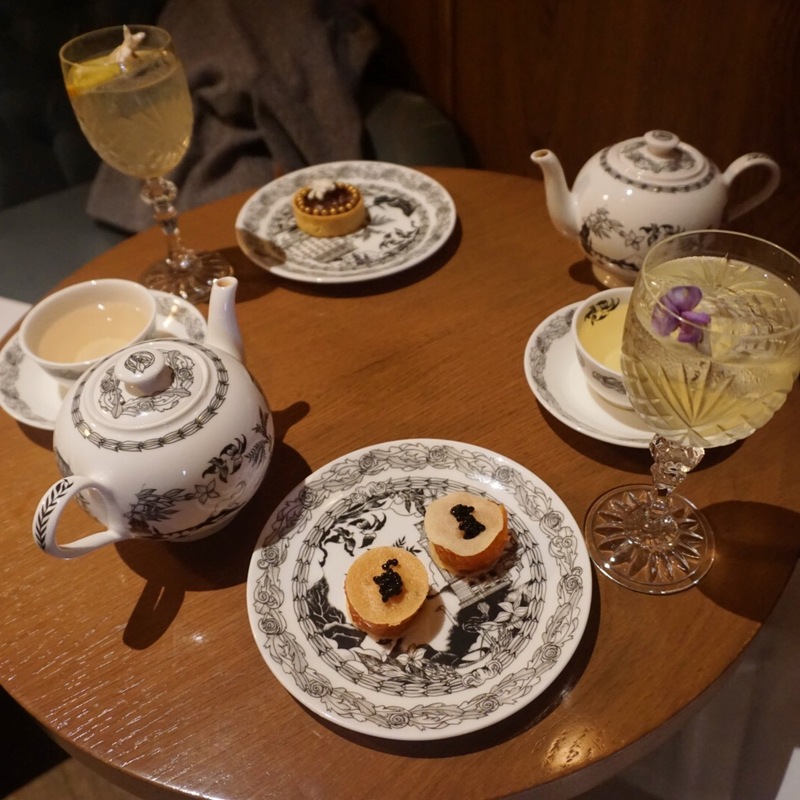 If you're looking for a unique take on afternoon tea, this is the place to go. It feels like a little secret nook far away from the tourists and tumult of London even though you are in a boutique hotel. I have a few more London adventures to recap, I hope to do so in the coming weeks! So interesting and informative. I know very little about punch! This was certainly different than seeing the towers of pastries we associate with afternoon tea. Thank you Andrea! I didn't know much about punch either, and now I need to learn much more! I think there are punch-centric places here in NYC, I need to seek them out. "Scandal Water" should be the title of your book, if you ever do one. And that "mystery" black tea made my ears perk. 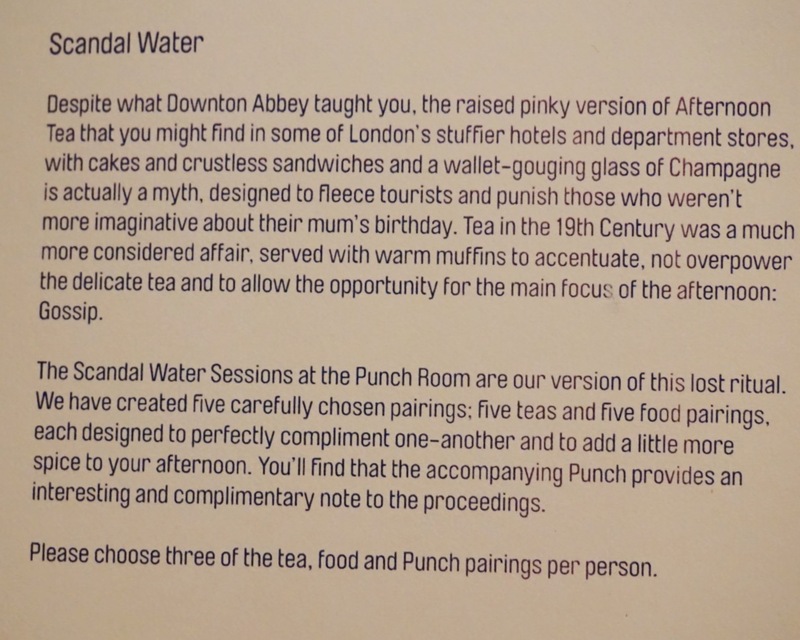 I want to refer to tea as Scandal Water all the time. And yes if there is a book, that will definitely be the title. Just want to say thank you Sara for this post... you've change my perspective about "British tea time" I hope one day you write about punch, since this is a new topic for me and I really would like to learn more. I'm so glad Mara! Thanks so much. Glad you enjoyed the post. I hope to do a little more research on punch and also the historical origins of British afternoon tea.